[S1] Ancestry.ca, online \Ancestry.ca\, DoupeDavid's Family Tree. Hereinafter cited as Ancestry.ca. 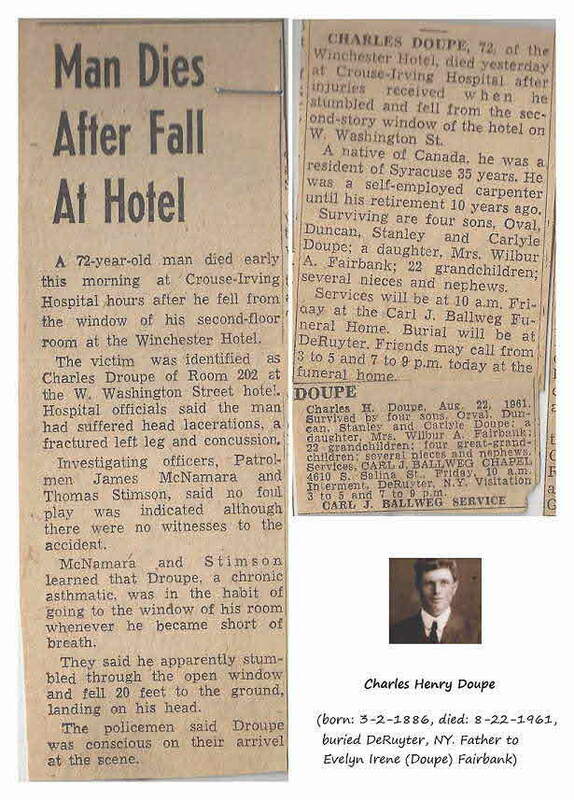 (Witness) Fact 1 Adam Chester Doupe witnessed the Fact 1 of Amos Doupe; Family of Amos Doupe and Mary Ann Switzer of Wetaskiwin, Alberta. 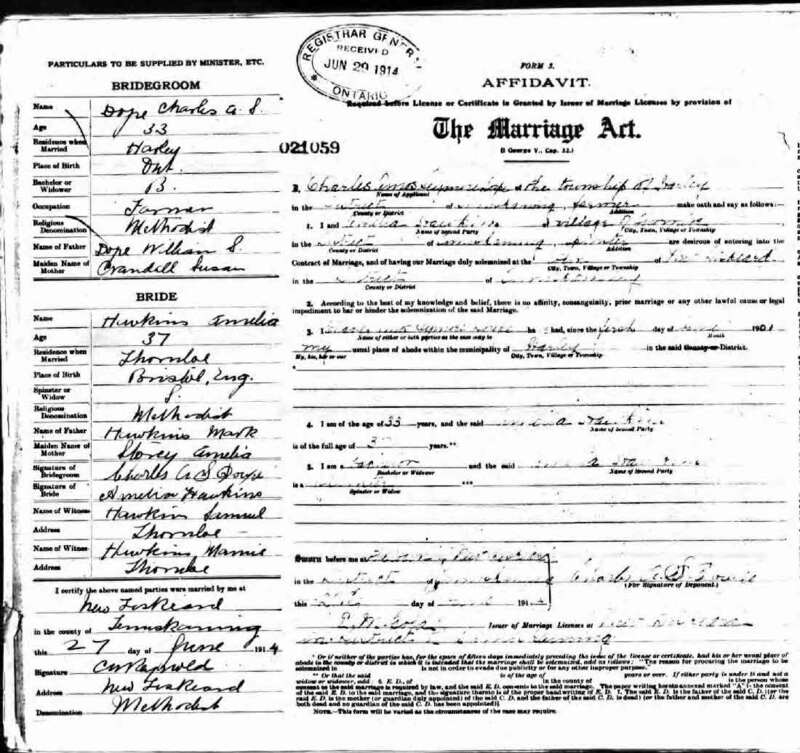 Marriage* Adam Matthew Doupe married Martha Shier, daughter of Jonathan Shier and Ann Ryan, on 15 February 1893 in Woodham, Perth County, Ontario, Canada; Married on same day as her sister, Catherine. Burial* He was buried in Kirkton Union Cemetery, Huron County, Ontario, Canada. 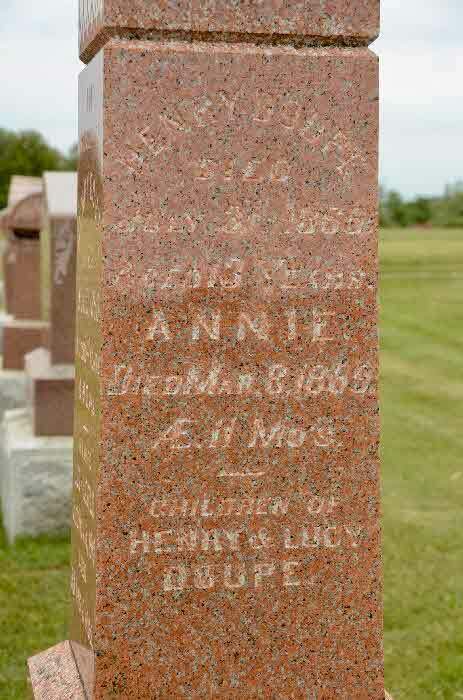 (Witness) Fact 1 Adelaide Susanna Doupe witnessed the Fact 1 of Amos Doupe; Family of Amos Doupe and Mary Ann Switzer of Wetaskiwin, Alberta. 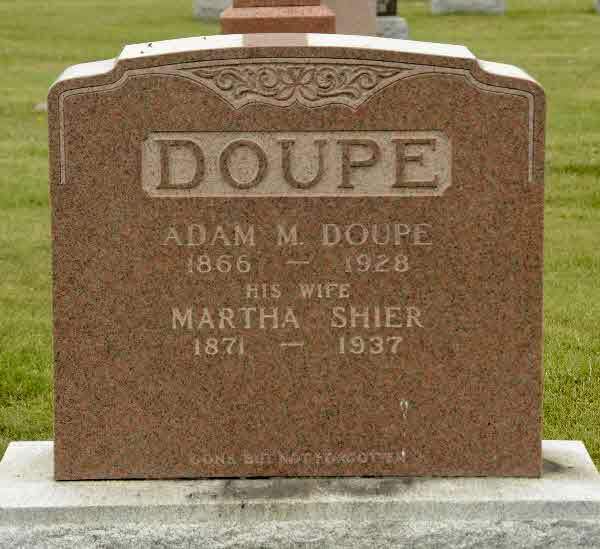 Death* Adelaide Susanna Doupe died on 11 January 1971 in Whitefish, Flathead County, Montana, United States, at age 66. Burial* He was buried in Harley Twp. 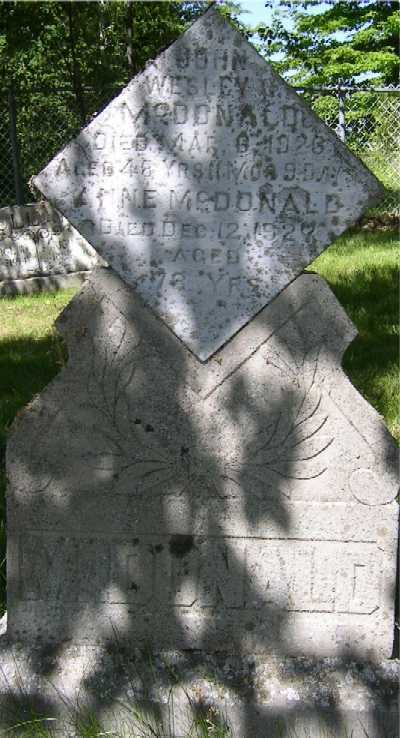 Cemetery, District of Timiskaming, Ontario, Canada. 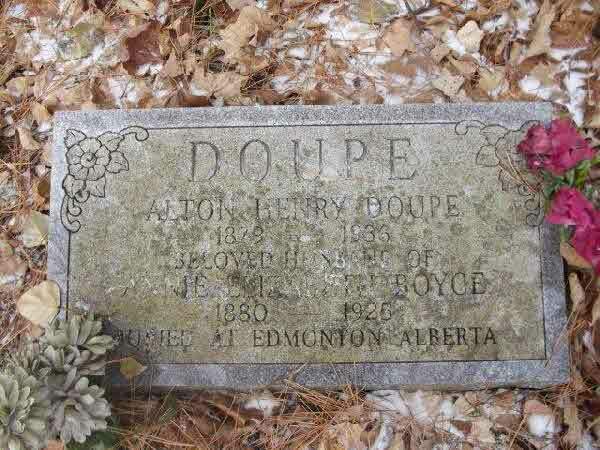 Death* Alton Sidney Doupe died in 1957 in Harley Twp. Cemetery, District of Timiskaming, Ontario, Canada. 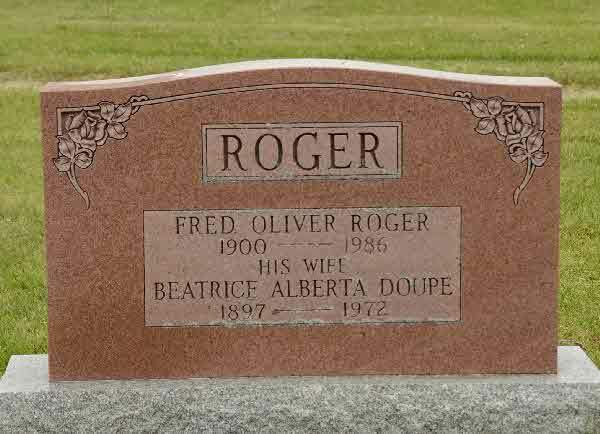 Fact 1* Family of Amos Doupe and Mary Ann Switzer of Wetaskiwin, Alberta. 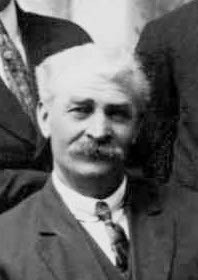 Death* He died on 21 March 1921 at age 58; A gloom was cast over the entire community Monday evening when it was learned that one of the best known and most highly respected farmers in the district, Amos Doupe, had been summoned to the great beyond. He attended the convention of the provincial Hail Insurance Board at Calgary last week, returning home Friday afternoon. On Saturday morning, after partaking of a hearty breakfast, and in apparently his accustomed rugged health, he went to the barn to do some chores, but shortly after returned to the house and complained of being indisposed. Medical aid was summoned and it was found he had been stricken down by an apoplectic stroke. Everything possible was done to combat the disease, but to no avail, and he gradually sank until about five oclock Monday evening, when the spirt took its flight. Deceased had always been a strong, healthy man, hence his removal so speedily has caused all the greater shock to his myriad of friends. 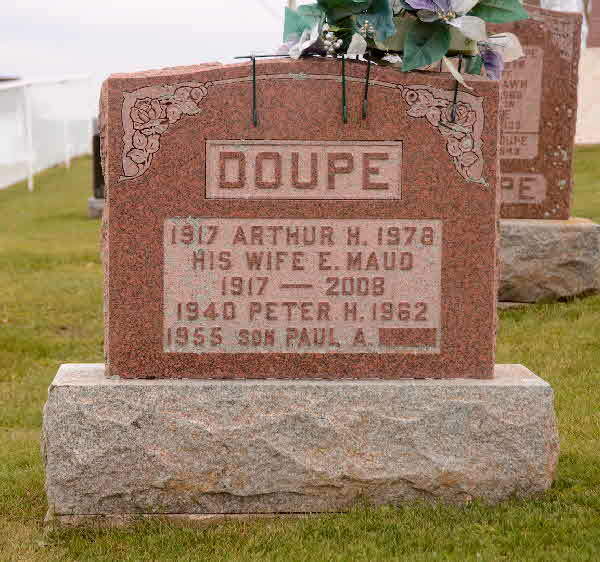 late Mr. Doupe was born in St. Marys, Ontario, on November 1, 1862, hence he was in his fifty-ninth year. He was one of the early settlers in the district, it being exactly twenty-one years to the day he passed away, that he located on a homestead in the Cherry Grove district, where he has since resided. was a man of broad vision and unblemished character, and always respected the opinions of others. Every movement having for its object the betterment of the community and its settlers ever found a staunch supporter in Mr. Doupe. He was the instigator in the movement to have the school district of Cherry Grove organized, and since its formation has been a member of the board of trustees, and acted in the capacity of secretary. took the keenest interest in the development of the country, and was elected about fifteen years ago as a councillor to represent his community on the old local improvement district council. He held this office most creditably until the formation of the Municipality of Montgomery on January 3rd, 1916, when he was elected as a councillor in that body. 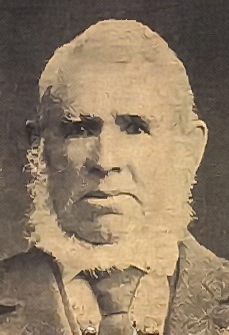 He served as councillor for one year, when he was elevated to the office of Reeve, which position he held until his demise. He was also an active worker in the agricultural society and always did his full duty as a member and officer. few years ago he was a prominent member of the Loyal Orange Lodge, and in religion he was a Methodist. leaves to mourn his loss, a widow, and family of three daughters and five sons, namely: Mrs. Neill Campbell of New Norway; Mrs. J. Malmas of Bears Hill, and Adelaide at home; and A. Chester of Edmonton; and George, Norman, Percy and Milton at home, besides a host of friends and acquaintances throughout the entire community. funeral took place from the late residence, Cherry Grove, on Wednesday afternoon, service being held at the home at one oclock, and at the graveside, by Rev. J.W. Wilkin. The interment was in Wetaskiwin cemetery. The funeral cortege was one of the largest ever seen in the community, friends coming near and far to pay their last tribute of respect to the departed. 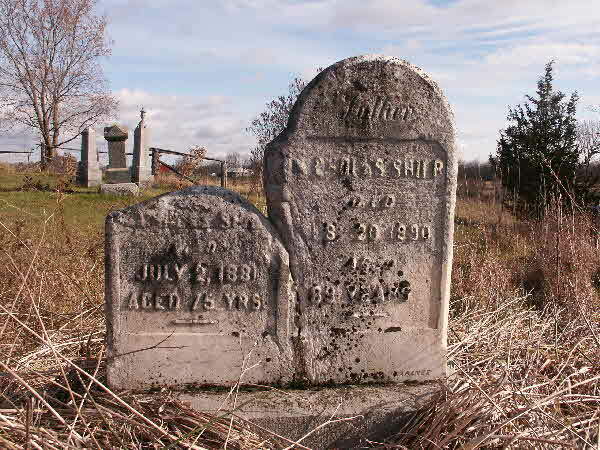 Burial* He was buried in Kirkton Union Cemetery, Usborne Twp., Perth County, Ontario, Canada. [S73] Ireland, Select Births and Baptisms, 1620 - 1911, online \, Baptism of Amos Doupe, son of Samuel Doupe and Catherine; FHL Film # 897365. 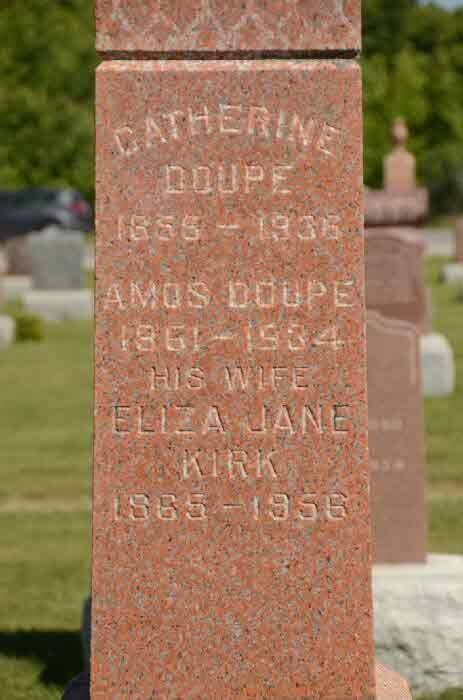 Death* Ann Doupe died on 2 July 1881 in Camden Twp., Lennox and Addington County, Ontario, Canada. 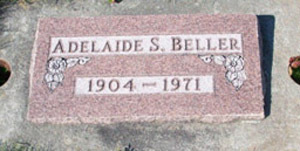 Burial* She was buried in Centreville United Church Cemetery, Centreville, Lennox and Addington County, Ontario, Canada. Burial* He was buried in Reidville United Church Cemetery, Camden Twp., Lennox and Addington County, Ontario, Canada. [S1] Ancestry.ca, online \Ancestry.ca\, Sage family tree. Hereinafter cited as Ancestry.ca. Burial* He was buried on 10 October 1930 in Exeter Cemetery, Hay Twp., Huron County, Ontario, Canada. Burial* She was buried in Harley Twp. Cemetery, District of Timiskaming, Ontario, Canada. 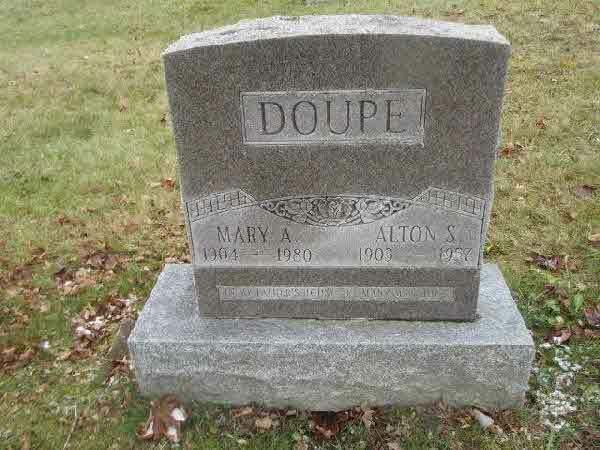 Burial* Baby Girl Doupe was buried in Kirkton Union Cemetery, Usborne Twp., Huron County, Ontario, Canada. Death* He died on 27 April 1914 in Crandall, Manitoba, Canada, at age 52; Manitoba Morning Free Press, Winnipeg, Apr 29, 1914: Crandall, Manitoba, APril 28. Yesterday morning Benj. 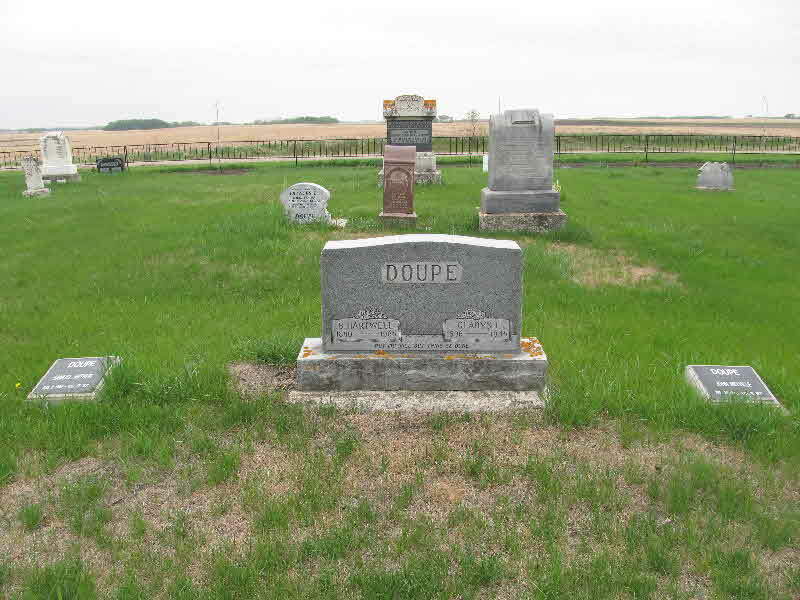 H. Doupe, one of the first pioneers of the Crandall district passed away after a lingering illness of about two weeks. The town flag was hung at half mast in his memory. 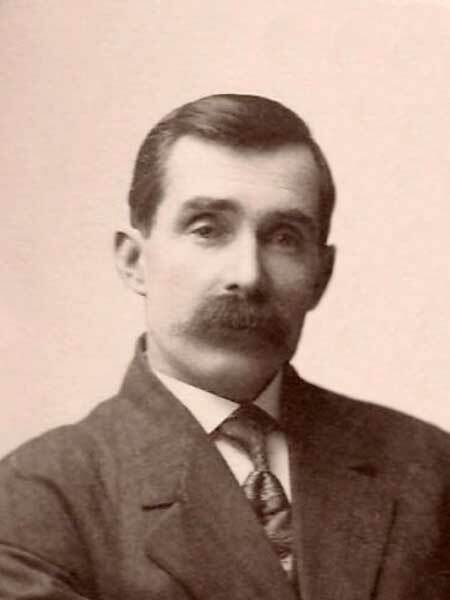 Mr.Doupe was born in St. mary's Ontario in 1851, and came to Manitoba and took up land in waht was known then as the Carlingville district, but which later when the C.P.R came through was changed to Crandall. In 1883 he married Miss Jane Webb, who with five sons and two daughters survive him. Gordon Doupe, Thomas Doupe, Arthur and Earl, all of the Crandall district, and Mrs. Alf Lints of Decker and Miss Mable Doupe at home. Mr. Doupe took an interest in everything he thought was for the good of the district. He has been steward of the Methodist church from the time of its inception, and was an independent in politics. He has held difference positions on the school board. Fact 1 BENJAMIN HARTWELL DOUPE (1861-1914) By Mrs. George Pearson The homestead of the first Benjamin Hartwell Doupe is located three-quarters of a mile north of Crandall, Manitoba, on 2-14-25. 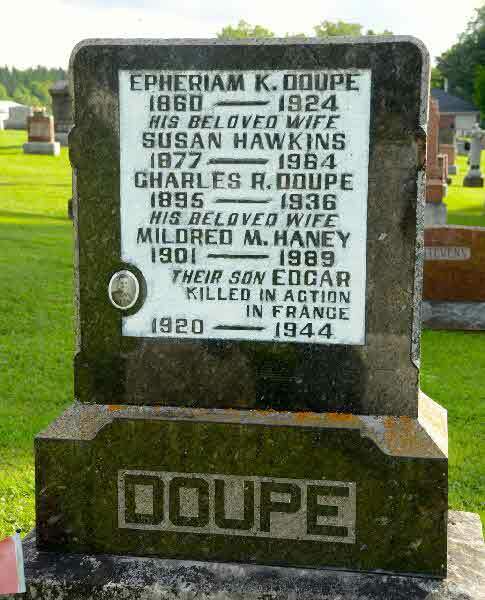 ?Benjamin Doupe was born May 31, 1861, at St. Mary's, Ontario, and died April 27, 1914, at Crandall, Manitoba. ?He came to Manitoba to take up his homestead in 1882. The end of the railroad was then at Brandon and he walked from there to where his homestead is situated. The community was later named Carlingville, when a school was built. first home was a dugout for himself and his oxen. 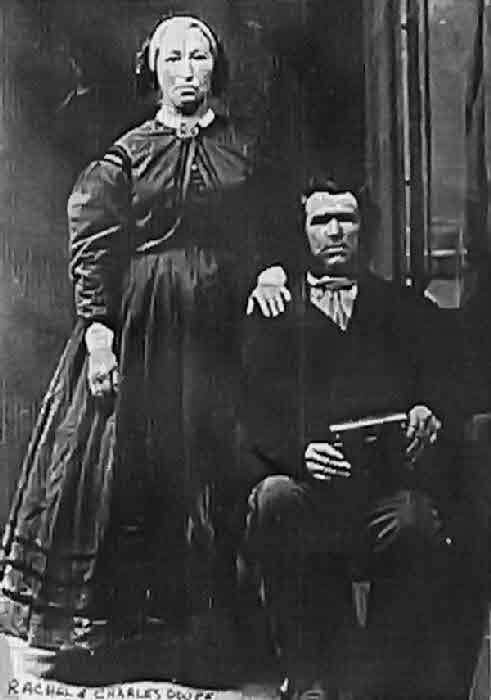 When he later built a log house, he married Jane Webb at Portage la Prairie. 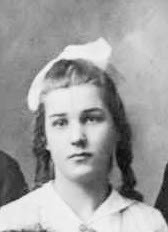 Jane Webb was in Goderich, Ontario, October 18, 1866, and died April 13, 1925 at Crandall, Manitoba. 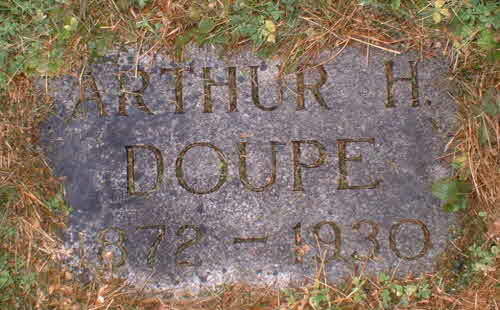 Doupe engaged in mixed farming and owned his own threshing machine. He was the first caretaker of Crandall cemetery and remained so until his death. He planted the trees at the Crandall Cemetery. were eleven children born to them on the homestead - five girls and six boys. 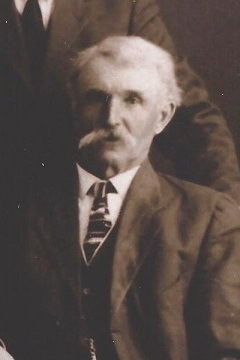 Mary Elizabeth married Leonard Johnston - one son, Delymer. Joseph Gordon, married Prudence Emily Eaton — two daughters, Marjorie and Geraldine. and Frances died in their youth. 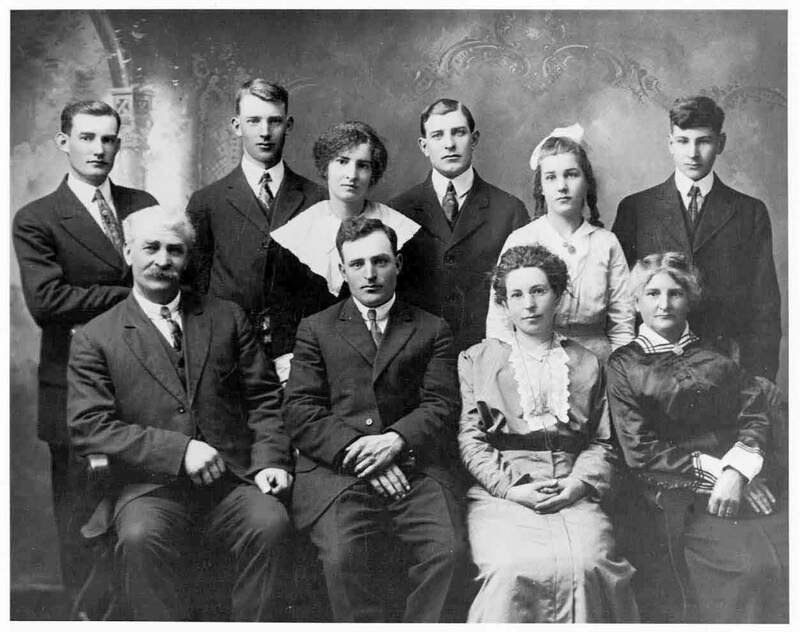 Hartwell married Gladys Irene Hume, one daughter, Margaret and five sons, Harold, Melville (deceased), Ben, Ron and Stan. Jane, married Alfred Lints, seven daughters and two sons, Edna, Elva, Hollis, Lois, Della, Christina, Fern, Sanford and Elwood. Doupe was unmarried. Arthur, married Gretta Phillips. Doupe, married May Jahnke, one daughter and one son, Lois and Arthur. Mabel, married George Pearson, two daughters, and one son, Jane, Georgina and James. 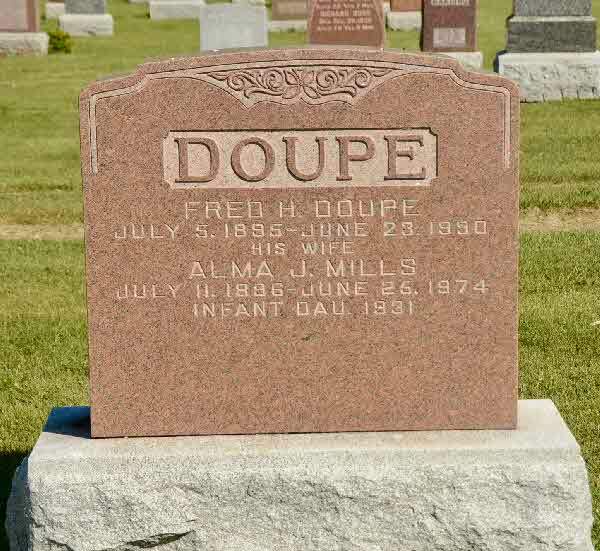 Doupe, died in infancy. Burial* She was buried in Kirkton Union Cemetery, Usborne Twp., Kirkton, Huron County, Ontario, Canada. 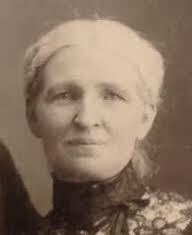 Birth* Cecilia Doupe was born on 1 December 1839. 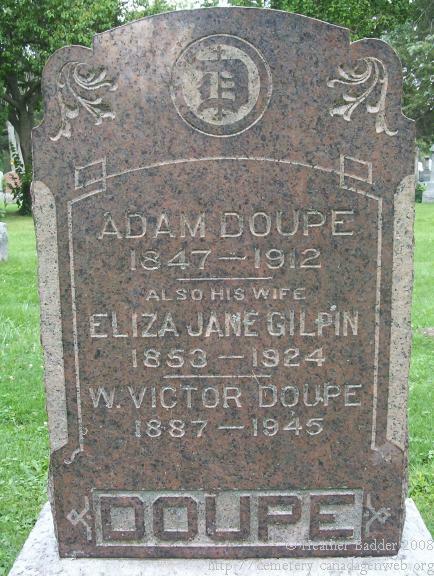 Death* Cecilia Doupe died on 17 June 1912 in Laird Twp., District of Algoma, Ontario, Canada, at age 72. 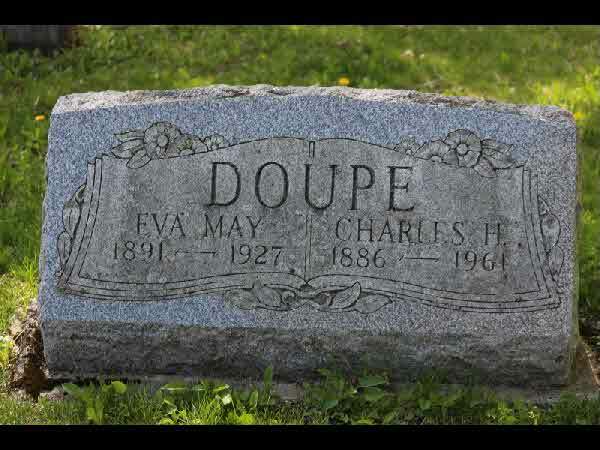 Death* Charles Doupe died on 23 August 1911 in Grey County, Ontario, Canada; Mr. Charles Doupe of this township passed away on Wednesday, Aug. 23, at the home of his son, Mr. Ehpraim Doupe, west back line at the age of 91 years 6 months. Mr. Doupe was a native of the Couny of Limerick, Ireland. He came to Canada in 1854 and settled in the township of Blanchard, when he married. Later he moved to the township of Egremont in 1856 where he remains until 1874. In that year they moved to Artemesia township where he remained until death called him away. 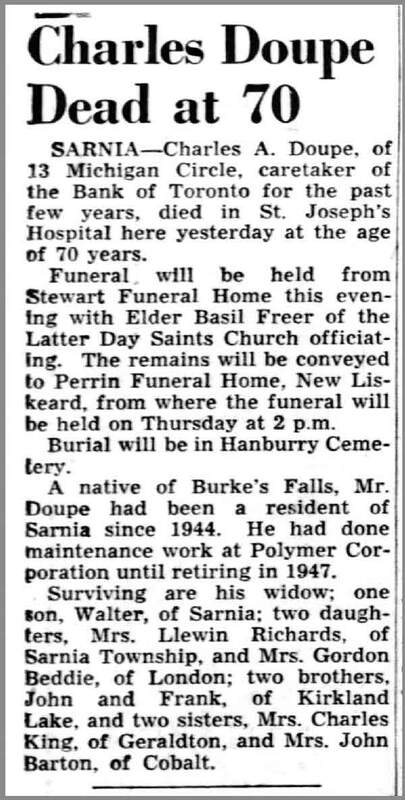 Mr. Doupe has been a member of the Methodist church since he was a young man and a member of the Orange Order for about sixty years and was buried by that order. 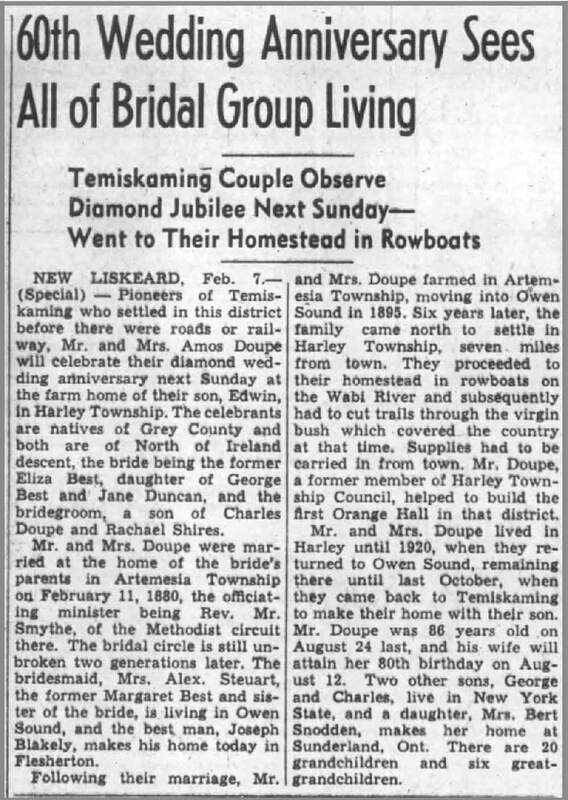 Mr. Doupe had a family of five children, Three boys and two girls - Sidney and Amos of New Liskeard, Mrs. Robert Best near Flesherton, Mrs. W. J. Spence of Toronto, Ephraim on the old homestead. The funeral took place to Flesherton cemetery on Friday afternoon, Aug. 25th. The funeral service was conducted by Rev. Mr. Campbell in the absence of his pastor. Rev. Mr. Wellwood. 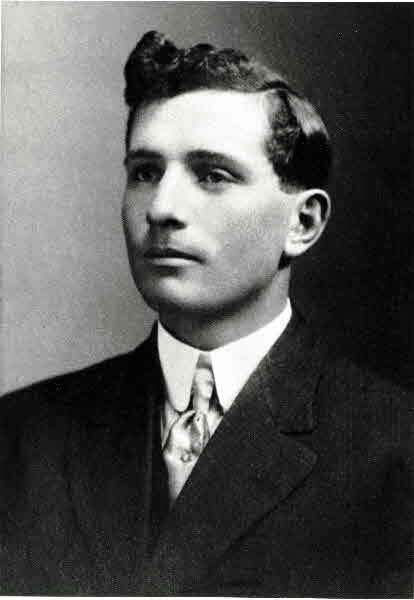 Birth* Charles Amos Seymour Doupe was born on 6 October 1881 in Artemesia Twp., Grey County, Ontario, Canada. 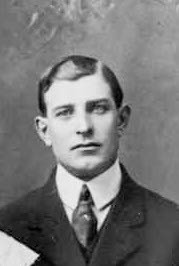 Marriage* He married Amelia Hawkins, daughter of Mark Hawkins and Amelia Storey, on 27 June 1914 in New Liskeard, District of Timiskaming, Ontario, Canada. Death* He died on 12 May 1952 in Sarnia, Lambton County, Ontario, Canada, at age 70. Death* He died on 22 August 1961 in Syracuse, Onondaga County, New York, United States, at age 75. 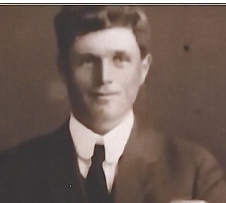 Death* Charles Robert Doupe died on 7 November 1936 in Flesherton, Grey County, Ontario, Canada, at age 41; Charles Doupe, a young farmer living on the West Backline, about three miles from Flesherton, passed away suddenly during the night on Friday last. He was the only child of Mrs. Susan Doupe and the late Ephraim Doupe and was born on the farm where he died nearly 42 years ago. He had apparently been in his usual health. In addition to farming he operated a threshing machine all day Friday and retired at night as usual. When Mrs. Doupe wakened about 5:30 on Saturday morning she discovered that he had passed away during the night. 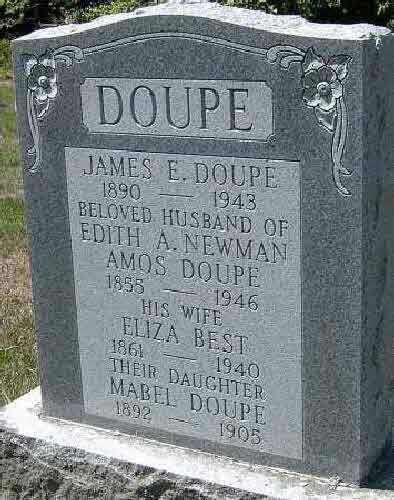 Mr. Doupe was a well known and successful farming and was married about 17 years ago to Miss Millie Haney, daughter of Mr.and Mrs. Robert Haney of Eugenia, who survives together with a family of two boys and three girls. Edgar and Irene, the eldest who are twins, Edna, Eva and John, all at home; also his mother Mrs. Susan Doupe. His father passed away in a much similar manner about twelve years ago. Mr. Doupe was a staunch Orangeman, being a Past master of the L.O.L No. 244, Proton Station, Past District Master of Artemensia, Past W.C. in C. of the Scarlet Chapter. He was a member of the United Church. The funeral took place on Monday afternoon to Flesherton Cemetery. 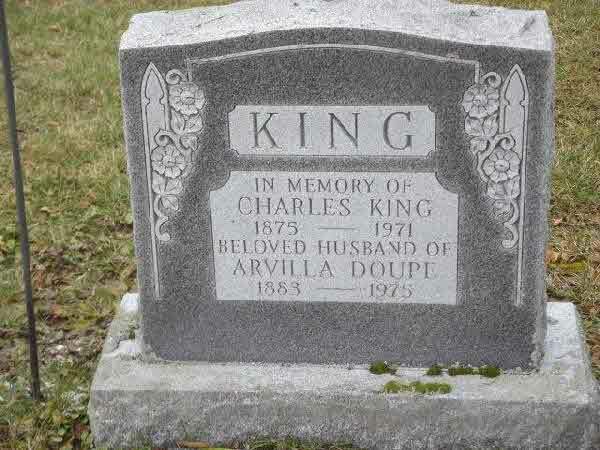 Burial* He was buried on 9 November 1936 in Flesherton Cemetery, Grey County, Ontario, Canada.